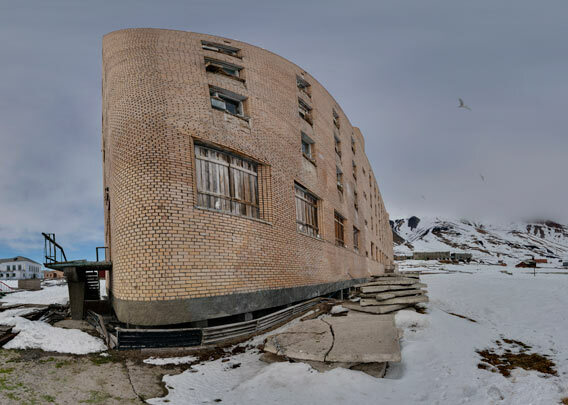 Former residential building in Pyramiden. This kind of building was very common in settlements built during the Sovjet period in Russia, you can find houses like this in many Russian cities today. In Pyramiden, there were several residential buildings like this, every one with dozens of appartments. Legend has it that one of them was called “London”: this is where single men lived. Single women had their homes in “Paris”. It is easy to imagine that there must have been pretty busy traffic between “London” and “Paris”. In case of too busy traffic, you moved eventually to the “Crazy house”, where families with children lived. A large building with accommodation for miners. Today, it is only inhabitated by Kittywakes that nest in the window frames. “Crazy house” still lives up to its name, but in a different way: today, there are no children playing anymore, but there are many kittiwakes nesting in the window frames, so there is still a lot of life and noise around this building.